Unhinged is the second book in the Splintered series, which is based upon Alice in Wonderland. Alyssa is the descendent of Alice and is half human / half netherling. She must decide if she will embrace her magic and help save Wonderland or if she will remain in the mortal world with her human boyfriend Jeb. When Wonderland starts to invade the human realm it is no longer an option. Alyssa must fight to defeat Red or she will lose everyone she loves. She also discovers that her feelings for Morpheus aren't as black and white as she thought. Morpheus is her childhood friend from Wonderland, who has been teaching and preparing her for this moment her entire life. She always thought his intentions were self-centered, but the more she learns about their past the more she realizes he has always protected her and had her best interest in mind. Personally, I am on team Morpheus. Alyssa can't live in the human world without being perceived as crazy or "unhinged". If she were to choose to live in Wonderland she would be Queen and all would be right in that world once again. Besides, I love Morpheus's cocky attitude and who doesn't love a British accent? This was an excellent sequel to Splintered and I can't wait to see how this series will conclude. Ms. Howard left most of the characters hanging in the balance at the end of this installment, which will certainly encourage readers to jump right into the final book in this series. 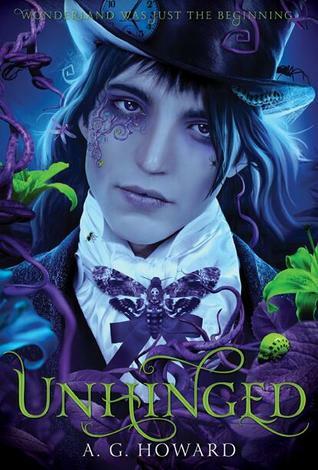 I gave Unhinged 4 stars and will definitely include Ensnared on my Summer TBR list. I had the chance to meet A.G. Howard at BEA in 2014 and picked up an autographed copy of Unhinged. I absolutely love the cover of this book and will keep the signed copy even though I have now completed it. I typically tear out the autographed page from free books I receive at conferences to add to my collection and place the books in my local little free library. I feel it is better to share the books with other readers than to hoard them on my shelves collecting dust, but I don't think I am going to be able to part with this one.